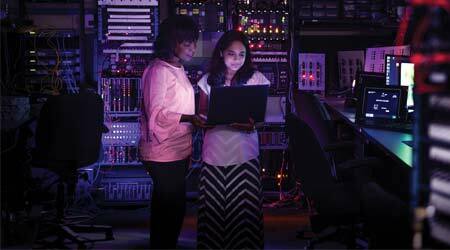 Sebrina Poythress (left) and Sireesha Vadlamani are members of NS’ PTC test team in Atlanta. On the homepage of Norfolk Southern Railway’s website, a tagline is prominently displayed: Reimagine possible. For NSers, it means continuing to find ways to build on the technological advances of today to craft a more safe, efficient and reliable railroad of tomorrow. Efforts to incorporate more technologies and automation have accelerated over the past few years, senior executives say. From predictive analytics to machine learning to artificial intelligence to smart sensors, there’s a host of innovations the Class I is adopting or exploring. The railroad is committing a lot of capital this year to that cause. The Class I has budgeted $150 million for technological pursuits in 2018, not including $140 million for positive train control (PTC) work, its largest-ever technology investment in a given year. Previous technology budgets were set at $110 million in 2017 and $77 million in 2016. To attain that objective, the company’s upper management will need to “be smart” as a team about high-tech pursuits, he says. That includes leveraging PTC — once it’s fully in place by 2020’s end after NS seeks a two-year implementation extension sometime in the third quarter — as an essential building block toward the goal of an automated railroad. It’s also vital to improve NS’ customer interface/experience to better engage, serve and attract shippers, and continue forging and expanding relationships with companies that have high-tech expertise, says Squires. To that end, the Class I earlier this year joined the Blockchain in Transport Alliance, a consortium of more than 250 transportation and logistics companies that aim to develop standards for and promote education on blockchain technologies. Blockchain enables supply chain participants to more securely access and share shipment information. NS also recently formed a strategic partnership with Plug and Play, a technology startup accelerator based in the Silicon Valley. NS joined Plug and Play’s supply chain and logistics innovation platform to engage with startup companies focused on creating applications involving artificial intelligence, machine learning, the Industrial Internet of Things and advanced analytics. “Plug and Play can help us with predictive analytics and automation,” says Squires. The railroad could stand to gain some going-high-tech assistance from the federal government, too, senior execs say. The Class I strives to adopt promising technologies created by others, as well as develop and implement its own — and experimentation and innovation are best driven by the efforts of private industry, they say. So, NS supports balanced and performance-based federal regulations that promote the private development of critical new technologies. Currently, many Federal Railroad Administration (FRA) regulations are configured for the rail industry of a century ago and don’t take into account technological advances, says John Scheib, the Class I’s executive vice president of law and administration, and chief legal officer. “We have switches with sensors, but the FRA still requires an eyeball inspection — a person to take a look at them twice a month,” he says. Performance-based regulations would open up more opportunities for railroads to experiment and innovate, says Scheib. “It’s like a bowling alley; we can go play in a lane while the FRA sets up the guard rails and establishes the parameters,” he says. The FRA’s No. 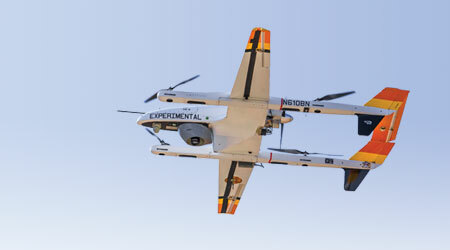 1 priority is safety, and the agency will engage with new technologies and automation in a manner that addresses legitimate public concerns about safety without hampering innovation, an FRA spokesman wrote in an email. “As a regulator, the FRA’s preference is for rules that deal with new technologies in a neutral manner, are performance-based and seek to enhance safety whenever possible,” the spokesman wrote. The new FRA leadership under Ronald Batory — who became administrator in February — is displaying more of an understanding about technologies, which is encouraging, says Scheib. Earlier this year, the FRA solicited comments from rail industry stakeholders, the public and other interested parties on the potential benefits, costs, risks and challenges to automated rail operations. “This request for information had not been done in the past,” says Scheib. NS provided a 41-page document to the FRA that defines how the agency could partner with the rail industry to promote innovation. It also describes some of the technologies the Class I is employing or planning to deploy. Among them: predictive models that NS recently developed to forecast when track curves will need replacement. Using machine learning, artificial intelligence and data points collected from on-track equipment, information technology (IT) employees crafted algorithms that can accurately predict track wear over a five-year period. With predictive analytics, managers can better plan repairs and maintenance, and reduce track downtime. 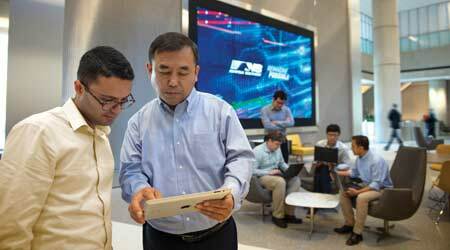 (From left) Mabby Amouie, senior manager of advanced analytics, and Clark Cheng, chief data scientist, help NS leverage Big Data and algorithms to complete predictive analytics projects. Track wear is one of several use cases for which NS developed analytical models by leveraging Big Data, with other applications to come. For example, the operations research (OR) and data science department has worked to improve curve track lubrication and now is focusing on tangent track, says Clark Cheng, senior director of OR and chief data scientist. The department also recently completed a project on locomotive health that involved Big Data and analytics. Locomotives waiting in yards to make their next trip now are plugged into “sleeper” stations that provide 480-volt power. 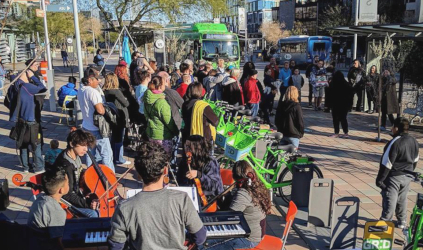 Engines then can be switched off, eliminating strain on engine water and batteries, cutting air emissions in yards and saving millions of gallons of diesel annually, according to NS. In addition, more than 200 sensors recently installed on locomotive engines provide data through a machine learning-based model that enables department workers to detect a loss of cooling water a week in advance and predict a dead battery a month ahead of time, says Amouie. If a locomotive develops an undetected leak in its cooling water tank, engine oil won’t remain sufficiently cooled and can overheat, shutting down the engine and potentially damaging components. The model helps prevent line-of-road failures and boosts the reliability and efficiency of daily train movements. Data science is not bound to one problem — you try to solve a number of issues that have the biggest impacts on operations and safety, says Amouie. “We’re just scratching the surface,” adds Cheng. That’s true when it comes to PTC. Leveraging PTC infrastructure is the pathway to automation, whether that means one-person crews or autonomous operations, says Fred Ehlers, VP of IT and chief information officer. The train-control technology can lead to a broader universe of applications primarily due to its pervasive network connectivity, precise location information, onboard computing, centralized oversight and control, and vast array of sensor-driven data. 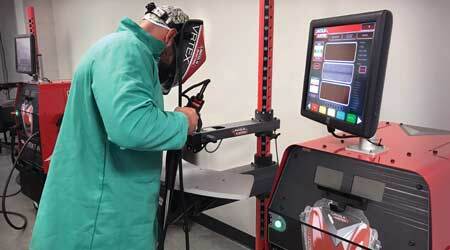 NS recently began using virtual welders at its Atlanta training center to teach the basics of rail-car welding without trainees needing to consume stacks of metal burn plates. For example, the GPS devices now installed on locomotives because of PTC will provide a more accurate location, especially in non-signalled territory, leading to better dispatching decisions, says Ehlers. Moreover, PTC and more precise locomotive GPS data will help make Movement Planner more effective. Developed by GE Transportation, the computerized tool analyzes different train movements scheduled for a given day and creates an optimized operating plan. NS execs believe there’s potential to leverage synergies between Movement Planner and other technologies — such as Auto-router — to explore the potential for advanced automation of many dispatch functions. Auto-router programs are designed to automatically route train movements in signaled territory with minimal or no dispatcher input, allowing them to focus on other tasks. NS is on a good path to autonomous operations, with PTC serving as the ultimate safety net, says Tom Schnautz, assistant VP of C&S and advanced train control-engineering. Since many technologies required for such operations already exist, it’s more a question of how fast they can all be integrated, he says. Looking ahead, NS would welcome more sensor technologies that could help the railroad better deal with or prevent disruptions, says Schnautz. For now, energy management (EM) systems are maturing, which has cracked open the door to automation, he says. An onboard locomotive computer that provides real-time information, an EM system evaluates various characteristics of a train’s upcoming move and calculates an optimal train speed. The first generation of EM systems provided information to locomotive engineers to help them make better train-handling decisions. NS currently uses a more modern generation of EM systems that feature an auto control device engineers can engage to automatically accelerate or decelerate a train at certain speeds. The EM computer connects to the locomotive’s throttle and dynamic air brake system to control speed and ensure safe handling while helping to reduce fuel consumption. NS is logging other technological advances with rolling stock, as well. An application is under development that would enable the mechanical department to schedule rail-car repairs based on data transmitted from wayside devices, says Director of Car Administration-Mechanical Jamie Williams. The tool might be implemented in about a year. For the past year, the department has been using a mobile device to determine if an end-of-train (EOT) or head-of-train (HOT) device will experience telemetry failure. The mobile device can perform a pass/fail test on each EOT or HOT. For more than two years, the department also has been employing an NS-developed device that uses cell- instead of radio-based communications to perform brake tests in a yard. The portable device, which communicates with a base station, is used in six yards and will be deployed soon at four others. The railroad employs a number of training simulations on iPads, including one employees can use to practice A-6 Class I air-brake tests. Meanwhile, other technological advances are becoming more apparent to the workforce. For example, the railroad recently created a virtual welding lab at its Atlanta training center featuring equipment developed by Lincoln Electric Co. The lab is used to teach the basics of rail-car welding without consuming stacks of metal burn plates. The virtual welders provide physical, auditory and visual feedback, and help accelerate training. 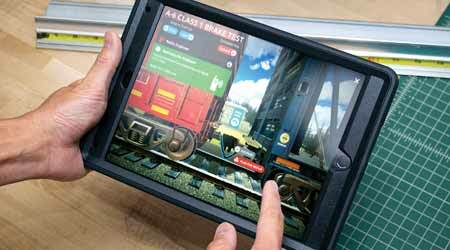 NS also employs a number of training simulations on iPads that were developed in-house or in partnership with a software vendor. The Class I recently designed one employees can use to practice certain air-brake tests. In addition, NS developed its own interactive e-learning programs to teach employees and test their knowledge on signals and blue-signal protection. Customer engagement is gaining technological enhancements, as well. Over the next few years, NS will focus on improving the customer experience and incorporating industry best practices, says CIO Ehlers. The company is working with customer relationship management firm and software provider Salesforce Inc. to ensure the experience is easier and more responsive. “Customers are used to dealing with consumer products all the time, like buying stuff on Amazon, so they have high expectations,” says Ehlers. Later this summer, NS plans to deploy case management software to create a record of a customer’s problem, which will remain in place until the issue is resolved. It likely will take similarly long for NS to reach its “railroad of the future” promised land. There are a lot of moving pieces to manage, many new and some old. Technology is a large part of the way every industry operates, be it trucking or restaurants like Chick-fil-A, says CLO Scheib. So, NS needs to remain aware of emerging technologies, which are being developed in all sorts of places, he says. Browse articles on Norfolk Southern Railway positive train control predictive analytics machine learning artificial intelligence smart sensors Blockchain in Transport Alliance Plug and Play Federal Railroad Administration GE Transportation Heartwood Inc. Salesforce Inc. Lincoln Electric Co.